After a good nights sleep and the hostel breakfast we set off on the circuito chico. This is a loop west of Bariloche which takes in some great views and goes past the famous Llao Llao hotel (although neither of us has managed to find out why it's famous, but apparently it is). It made a change to be able to leave the luggage behind, it was good to remind ourselves what it is like to be able to cycle up inclines without resorting to the granny ring. The 18km road out to the 40km loop is surprisingly busy for what is in effect a dead end road. Most of that road is lined with hotels and spas and cabañas which probably gives rise to all the traffic. On the loop itself it got a lot quieter, and it's a popular place to rent bikes to do the circuit, so was nice to share the road with other bikes for a change. Being rentals they were all kitted out with helmets and Sam Brown belts, whereas motorcyclists tended not to be wearing leathers or helmets - seems backwards to us Brits. There are a number of places advertised as 'casa de té' on the circuit, and so we had high hopes of having tea and cakes enroute. Unfortunately, everywhere didn't start serving tea until 4:30pm. Before that time, they were either closed, or had a different (restaurant) menu. Shocking! We had to make do with a beer from the brewery on the way back into town to make up for it. For our evening meal we had decided to go for parrilla. After much deliberation, we opted for a restaurant which had a reputation for serving large portions of good quality. The food was excellent, and the staff seemed to really take pride in the cooking. 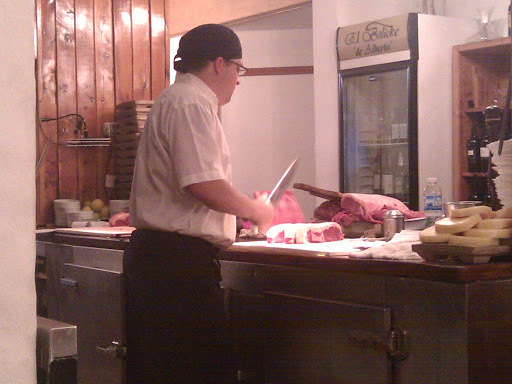 We sat next to the (open) kitchen, so got to see the meat being prepared for cooking. Very interesting. We managed to find room for icecream from one of the many icecream parlours for pudding too. Tomorrow we head around lake Nahuel Huapi in the opposite direction towards Villa la Angostura and the seven lakes drive.